The de-classification of Air Ministry Orders dating back to the outbreak of World War II, has unearthed another amazing scheme to demoralize the enemy. Code named "Operation Noel", the plan was intended to baffle the enemy into thinking that Christmas 1939 would be like any other Christmas and subsequently the German forces would all go home for their vacations leaving "Fortress Europe" undefended. The planning of "Operation Noel" was meticulous and various AMOs were issued and strictly applied. 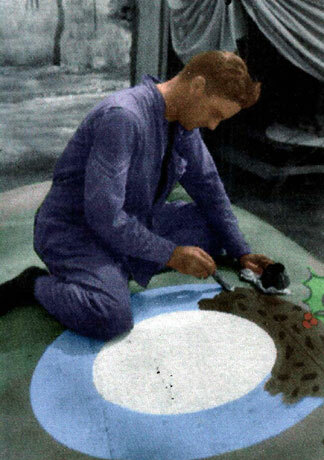 This picture shows Sgt Bert Hopkins duly re-painting the national markings of Spitfire MkV MB255. AMO A.989. Camouflage, Colouring and Marking of Aircraft. 1. The following regulations which take effect immediately, apply to all aircraft of the RAF during the Christmas festivities and supersede those contained in all previous Air Ministry orders. (i) Roundel to be painted in Dark Pudding throughout. (iii) Red disks (3 of) to be juxtaposed directly below the Holly insignia in Bright Red. (iv) Fruit peices may be randomly painted (at the squadron COs' discretion) on the roundel in Raisin Brown. (if this is unobtainable, Sultana Brown can be alternatively applied). (v) Fleet Air Arm aircraft may (again at the squadron COs' discretion), apply an alternative top coating of Rum Sauce White to the upper surface of the roundel. However, notification must be provided that this should be moderately applied due to the high alcoholic content of this colour. AMOs' A928/36, A.30/37 and A.157/38 cancelled till Jan 1st 1940.